Augustine A. 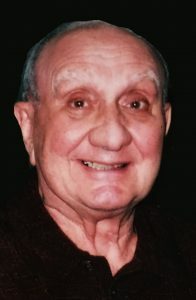 “Augie” Costanzo, of Woburn, passed away at Winchester Nursing Center, early Thursday morning, November 29th. The beloved husband of the late Dorothy T. (Wentzell) Costanzo, he was ninety-three years of age. Loving father of Dale M. Bevins of FL, and Fran Connolly of Woburn. Cherished “Grandpa” of JP Connolly, his companion Laura Crusco, Doug Connolly, his fiancé Liz Miller and Gary Bevins, great-grandpa of Emma and Johnny. He was predeceased by his siblings, Ella Facchini, Rose Carciofi and Christine Carbone. Also survived by many nieces and nephews. A Funeral will be held from the Lynch-Cantillon Funeral Home, 263 Main Street, Woburn on Saturday, December 1st at 8 a.m. followed by a Funeral Mass in St. Barbara Church, 138 Cambridge Road, Woburn at 9. Relatives and friends are respectfully invited to calling hours at the Funeral Home, Friday evening, November 30th, from 4-7 p.m. Interment in Woodbrook Cemetery. At the families request and in lieu of flowers, remembrances may be made in Augie’s memory to the Disabled American Veterans, State House, Room 546, Boston, MA 02133 or to the Winchester Nursing Center, 223 Swanton Street, Winchester, MA 01890. Augustine A. “Augie” Costanzo passed away peacefully early Thursday morning, November 28th. The beloved husband of the late Dorothy (Wentzell) Costanzo, he was ninety three years of age. Born in East Boston “Augie” as he liked being called , was raised in E. Boston for a while, and then to Somerville where he attended high school. World War II broke out and Augie left school and entered the United States Navy, proudly serving his country during this time. He was the very proud recipient of his high school diploma, along with his fellow World War II Veteran’s eighteen years ago from Somerville High School. Following the war he returned home where he married his sweetheart Dorothy, They journed together over the next sixty three years, bringing two daughters into the world. He and Dorothy decided that in 1955 they wanted their children brough up in the “suburbs” and had moved to Woburn at that time. They made their home in the West side of Woburn where he had remained right up to two years ago. Augie began working as a bookbinder in Waltham, having served as the President of the Bookbinders Assoc. Later he began working for the United States Postal Service, where he was a Postal Service worker in tn the Woburn Office, retiring at fifty nine years of age. Summers were always at HamptonBeach, and when the grandchildren began arriving he would be sure they too were there at the “Little Hank” each year! He loved spending time with his grandsons, taking part in all that they did, which certainly kept him very, very, busy and enjoying every moment. Many happy memories were shared throughout the years. Always a very busy man Augie loved his home and was very proud of it. He was always doing something from the lawn and flower upkeep to shovelling the snow, not just at his own home, but for some of his dear neighbors too! Summer was vegtable and flower season and he was meticulous at it, reeping what he planted all throughout the summer and fall. After he retired he would cook all the meals and made sure that each eveing Dorothy arrived home , there was a delicious hot meal awaiting her! When she retired a short time after Augie, they would travel to Florida for the winter. They were in St. Petersburg for a while, later going to Panama City Florida, where they had a host of wonderful friends to enjoy their winters with! And of course the arrival of their dear children and grandchildren to bask and frolic in the sun with them during school vacations! When he was a child he and his Dad always made their own models and beautiful clocks. This Augie continued throughout his lifetime, and had quite the collection of both. Travelling with Dorothy and his sisters and husbands, they had a ball. New York City, California, Hawaii, Niagra Falls to name a few and o all enjoying each others company. Augie suffered a stroke fifteen years ago, never letting that get in the way of living each day to the fullest. His attitude, courage, great faith and determination kept him going strong. A man of great integrity, kindness and unconditional love of family and friends, is the wonderful legacy that he has departed on those who had the distinct honor and priviledge of sharing life with Augie. Sadly, he was predeceased by his wife Dorothy and dear sisters Ella Facchini, Rose Carciofi, and Christine Carbone. He is lovingly survived by his adoring daughters, Dale M. Bevins of FL, and Fran Connolly of Woburn. Cherished “Grandpa” of JP Connolly, his companion Laura Crusco, Doug Connolly, his fiancé Liz Miller and Gary Bevins, Great-Grandpa of Emma and Johnny. Also survived by many nieces and nephews. A Funeral will be held from the Lynch-Cantillon Funeral Home, 263 Main Street, Woburn on Saturday, December 1st at 8 a.m. followed by a Funeral Mass in St. Barbara Church, 138 Cambridge Road, Woburn at 9. Relatives and friends are respectfully invited to calling hours at the Funeral Home, Friday evening, November 30th, from 4-7 p.m. Interment in Woodbrook Cemetery. At the families request and in lieu of flowers, remembrances may be made in Augie’s memory to the Disabled American Veterans, State House, Room 546, Boston, MA 02133 or to the Winchester Nursing Center 223 Swanton Street, Winchester, MA 01890. A Funeral will be held from the Lynch-Cantillon Funeral Home, 263 Main Street, Woburn on Saturday, December 1st at 8 a.m. followed by a Funeral Mass in St. Barbara Church, 138 Cambridge Road, Woburn at 9. Relatives and friends are respectfully invited to calling hours at the Funeral Home, Friday evening, November 30th, from 4-7 p.m. Interment in Woodbrook Cemetery. I am so sorry to hear of the passing of your dad Augie, he was a very special person and a wonderful friend to my parents. May he Rest In Peace, my thoughts and prayers are with all of his family. I will miss Augie. On Maura Drive he encouraged and cajoled me to run faster. After his stroke I got to know Dot better. She was an angel then as she is now. They loved each other very deeply. Augie still played a role in my life after he moved to Winchester. I’ll always have fond memories of Augie and his family. I will miss Augie very much. As my neighbor, he encouraged and cajoled me to run faster. After his stroke, I got to know Dot better; she was an angel then as she is now. Augie played an important role in my life here in Woburn even after his move to Winchester. I’ll always have very fond memories of Augie and his family. My deepest sympathy.